Ruby-throated Hummingbird at a Eupatorium flower. Photo: Carmen Elia/Audubon photography Awards. What's one thing you can do to help birds and cut down on mowing, pruning fussy ornamentals and ripping out dead flowers before winter sets in? Think about it. Your garden is your outdoor sanctuary, whether it's a backyard, a patio or a simple potted plant on an urban windowsill. When you fill your sanctuary with native plants it becomes a vital recharging station for birds passing through and a habitat for nesting and overwintering birds. As urbanization increases and natural habitats disappear, native plants can go a long way to restoring the environments birds need--and free you from the tyranny of the lawnmower. 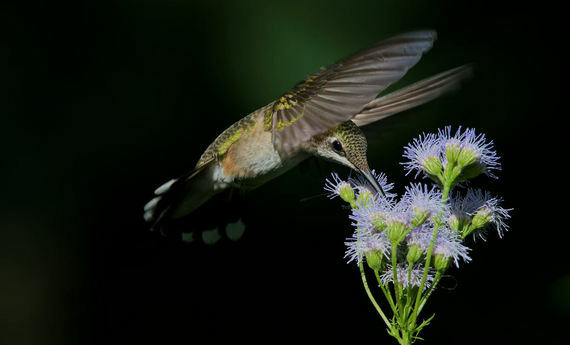 That is why the National Audubon Society is launching our nationwide Plants For Birds campaign urging Americans to grow one million bird-friendly native plants in the coming year. We have created an easy, one-of-a-kind bird-friendly native plant database. Just plug in your ZIP code and we'll show you hundreds of native perennials, vines, grasses and other plants that grow in your area. Nearby Audubon support centers, nurseries and retailers are also listed for help in obtaining the right plants. And now--early fall--is the best time to plant trees, bulbs and shrubs. The welfare of birds is linked closely to the quality of food and shelter found in their habitats. Most landscaping plants available in nurseries are exotic species from other countries. Many are prized for qualities that make them poor food sources for native birds--like having leaves that are unpalatable to native insects and caterpillars. About 96 percent of all terrestrial bird species in North America feed insects to their young. That means planting insect-proof exotic plants is like serving up plastic food. No insects? No birds. For example, native oaks support more than 530 different species of butterflies and moths alone. The non-native ginkgo tree supports just three. Caterpillars are the go-to food source for migrant and resident birds. In the 16 days between hatching and fledging, a clutch of Carolina Chickadee chicks can gobble more than 9,000 of them. Recent science points to native landscaping as a key tool in increasing bird diversity and abundance. In a study of suburban properties in southeast Pennsylvania, for example, researchers found eight times more Eastern Towhees, Veeries, and Scarlet Tanagers -all species of conservation concern--in yards with native plantings as compared to yards landscaped with typical alien ornamentals. For decades, our standard of green beauty and orderliness has centered on a carpet-like lawn and manicured foundation plantings, an aesthetic that largely excludes birds and other wildlife, consumes vast quantities of water, is high maintenance--and has a hefty carbon footprint. In fact, each week during spring and summer, some 56 million Americans mow 40 million acres of grass--an area eight times the size of New Jersey. That's not good for birds, the environment or your hard-earned leisure time. More than half of North American bird species are threatened by climate change and could lose more than 50 percent of their current ranges this century, according to Audubon's Birds and Climate Change Report. Our study shows that in order to protect birds, we need to reduce the emissions that cause climate change and protect the places on the ground that birds need now and in the future. Planting native grasses, trees and shrubs does both. Replacing lawns with native plants lowers the carbon produced and water required to maintain them. And native gardens also help birds be as strong as possible in the face of the climate threat--by providing food, shelter and protection. Native plants have adapted to thrive in their regional landscape, without added water or nutrients. With climate change models predicting increased episodes of extreme drought such as California is experiencing, it's good common sense to shift to water-wise yards and native plants. And, less lawn means less time mowing, weed whacking and edging. OK, so landscaping with native plants isn't maintenance free--invasive weed species are an ongoing issue in any garden. But with careful landscape planning and plant selection, you can create a garden space that minimizes the amount of time and money you spend. Native plants also give you fewer fall garden clean-up chores. Leaving native plants uncut in the garden over the winter gives birds valuable food sources and protection from weather. Every plant helps--so join bird lovers across the country as we collectively grow one million native plants for birds. Together, we can rebuild a natural landscape that provides a sustainable source of food and shelter for wildlife, is better for the environment and easy to care for. Besides, don't you have something better to do than cutting the grass? Follow David Yarnold on Twitter: www.twitter.com/David_Yarnold.